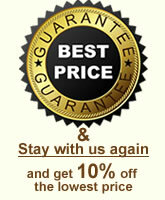 To book directly through our site is worth the most. We guarantee the lowest prices on our website www.FukasApartments.com, . There is no more favorable price than on our website. It is very important that if you book with us – directly through our website, you will automatically receive a 10% discount for each further stay, in all countries, in all cities and all apartments. This applies for each guest who makes a reservation directly through our website.